Wow.. after almost four solid months of not posting, I finally feel like I'm at a stage where I can ease myself back into blogging again. If you didn’t already know, I moved to Bristol in September to start a new chapter in my life at university, and it has left me with very little time to blog. The last four months have been the single most craziest, happiest, exciting and busiest four months of my life. Before leaving for uni, almost every single person I saw informed me that I was just about to begin 'the best years of my life' and meet 'the best and closest friends I'll ever have'. Four months ago I remember my mum squeezing me and saying, 'Enjoy every single moment', and realistically, I didn’t really know what to expect. Sometimes films, people or experiences get over-hyped and can be a bit of a let down, and I was worried that uni was going to be one of those kinda things. I couldn’t have been more wrong. So, now that I’ve got the partying, socialising, settling in and just generally being happy-ing out of my system (ish), I think it’s time to revive my little blog. Quite recently I went to the Superdrug Beauty Studio for the first time and was veeerry impressed. There is currently only one Beauty Studio in the UK and it is located in Cardiff (eeeee - pretty close to me!). The Studio offers a premium range of makeup, hair and fragrances whilst also offering quick beauty treatments in the Styling Bar and hair treatments in the salon, Hairspace (more info here). 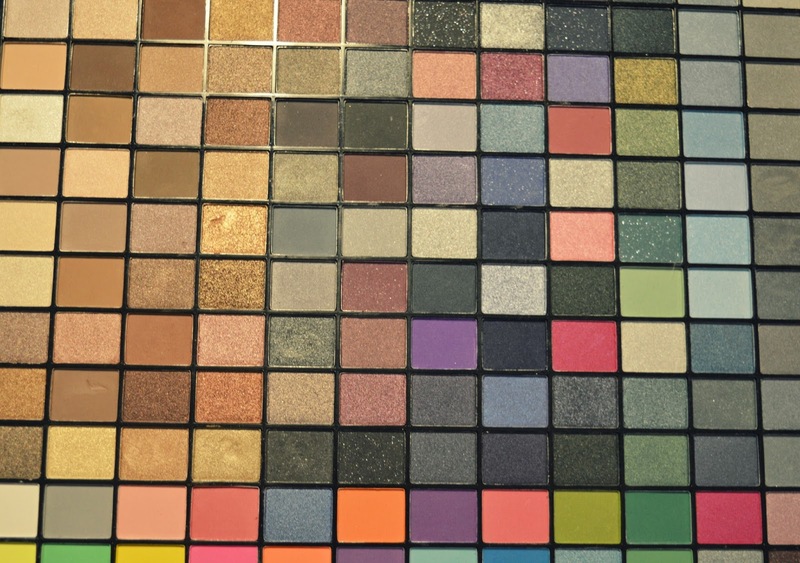 Whilst having a little look around (and indulging in a few treats) I came across this impressive 144 colour Ultimate Eyeshadow Collection by Makeup Revolution. Not only is this the biggest eye shadow palette I have ever seen, it's also one of the cheapest. I paid £10 for this little beauty. £10!! 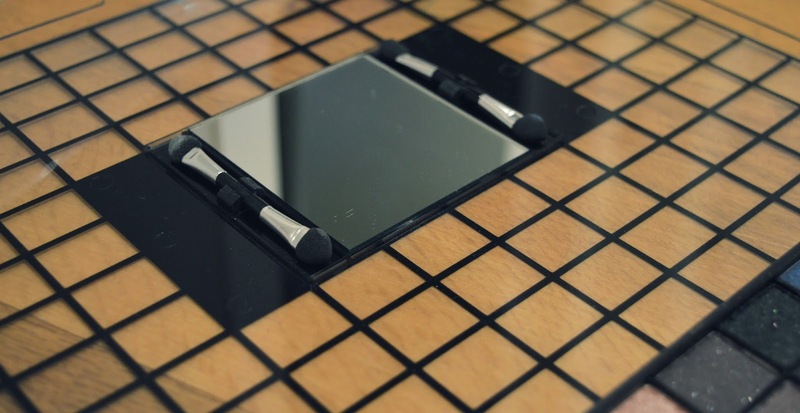 It was reduced from £20 in the Studio and is available at it's reduced price online. The first thing that I absolutely adore about this palette is (obviously) the extensive range of colours that it has to offer. The palette doesn't have just one theme of colours throughout, such as nudes or darks, but instead has pretty much any colour you could ever want or need. 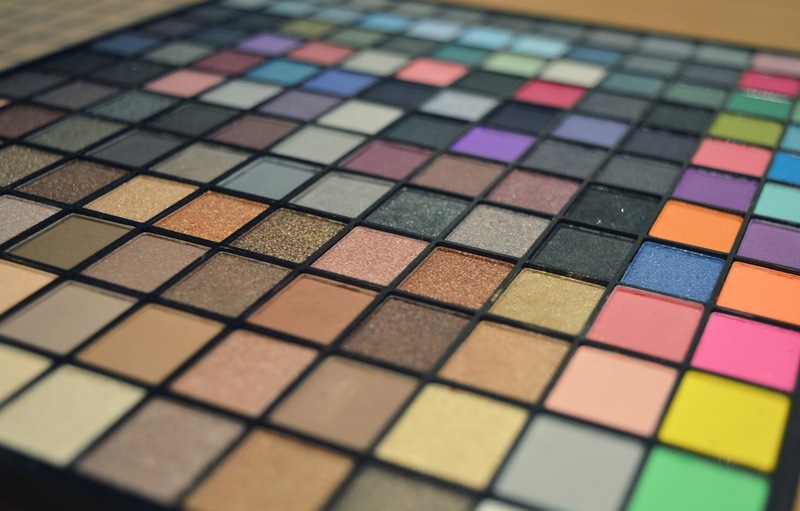 The textures throughout the palette also vary from mattes to glitters and shimmers. 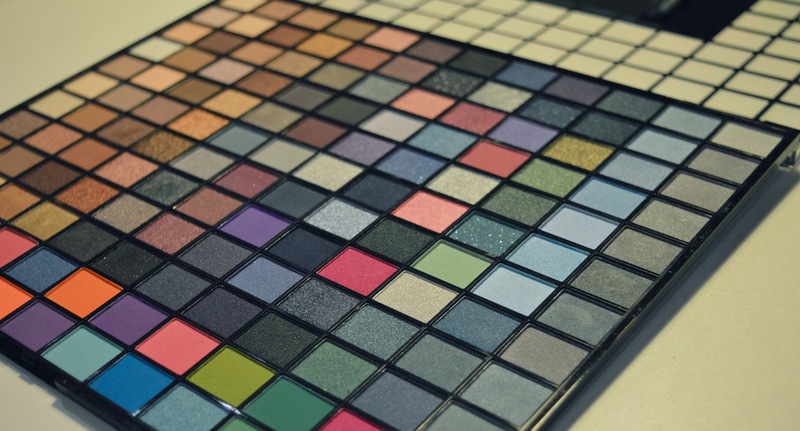 Basically, every colour or texture you could ever want for your eyes lies in this one palette. Anyone would think it was a gift sent personally from God. Considering the student-friendly price, I was a little apprehensive when first trying out the shadows, but it turns out I had no reason to be. All of the shadows are extremely pigmented and have very long-lasting wear time - such a relief/surprise! All of the colours also blend gently and easily, meaning you can create so many different looks. My favourite shades are the shimmery nudes and matte blacks and greys - you can attempt the smokey eye in so many different ways with this palette! Granted, the neon yellow, green and pink shades may not come into my every day use, but they are still fun to have a play around with. Fancy dress parties? My make up is sorted. I would honestly say this is one of my favourite and most savvy buys to date! For just a tenner, I could open an eyeshadow shop with the amount of colours and textures I have. They are all of excellent quality and when paired up against palettes such as the Urban Decay Naked palettes, they put up a pretty good fight and come pretty close (and are a good £20 less!). If you're looking to save some pennies but want some new luscious shades, I would definitely recommend this gorgeous palette. 10/10 for Makeup Revolution! Sounds awesome! I orderns this palette yesterday and i want it even more now! Can't wait to play around with it! With parre-stone surrounding the shoe and a rigid protection in the back, cheap timberland boots it feels really safe in the delicate passages, rocks, branches . The weight is 1306 g (weighed) in 42.5, they are a little heavier than my Asolo but the sole is flexible enough, timberland outlet uk I sometimes let myself fast descents. There are no self-locking hooks laces forcing to a blocking node, the tongue is more prominent but once the proper setting is found, timberland outlet sale the lacing holds and the maintenance and protection are effective. Beauty Studio in Cardiff is great, I love the make up rec brow kit. Just as good as the Benefit one and only £2.50! Hi Amy, how are you? I hope you are well. Omg I love the Platte, Jesus I wouldn't need anything else in my life - good bye husband I have the ultimate eye shadow collection.